The idea of wood flooring in a high-moisture space like a bathroom seems like a big mistake, but products like engineered hardwoods are allowing more homeowners to utilize wood floors in their washrooms. This will come with its own set of decorative challenges, but there are plenty of bathroom accessories and vanities that can combine perfectly with the new flooring. What sets engineered floors apart from solid wood flooring is their use of several layers of plywood with a layer of veneer on top. This dramatically improves their moisture retention and longevity, but you should still take steps to protect it. Be sure to install area rugs around your sink and shower area, as these are places where water tends to accumulate. As for the rest of the room, consider a bathroom vanity in a wood finish that matches your flooring, as well as a new set of wood blinds. Incorporating these natural accents in tandem with a few modern bath products will create an intriguing mix of decorative styles. 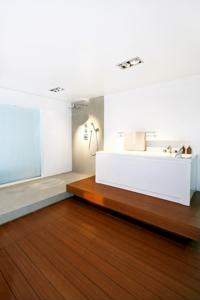 Engineered wood floors are just one of the many intriguing accents you can incorporate into your redesigned bathroom. What decorative suggestions do you have for those who are installing these floor coverings?